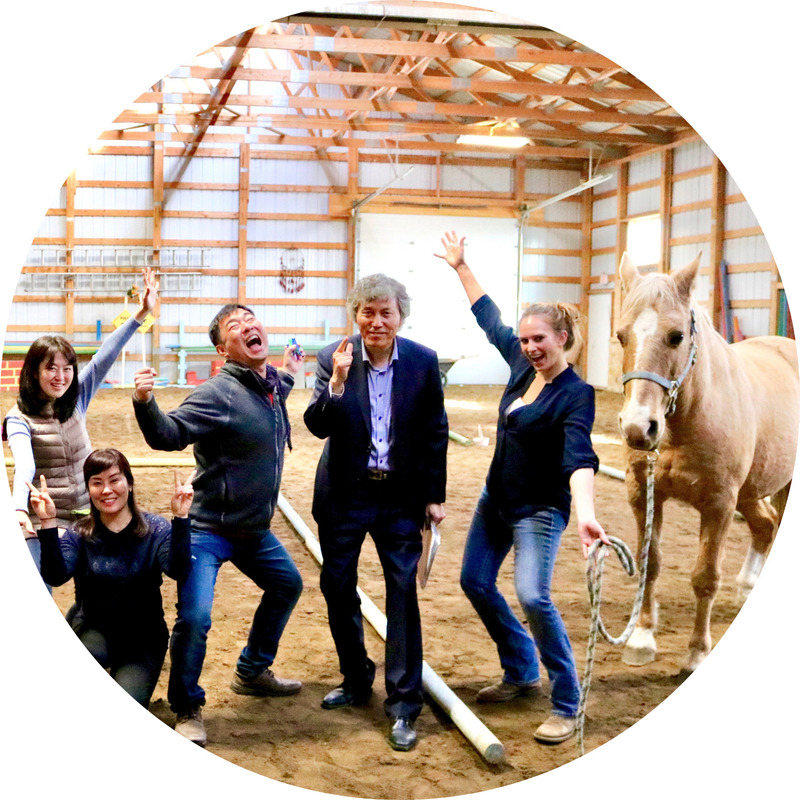 What our clients had to say about Team Building with Horses! Today was a unique experience – it provided a different style of learning that will provide a long lasting affect beyond any classroom can offer. As a relatively new team it inspired and provided cohesiveness that will keep driving performance. Thoroughly enjoyable, well organized and fun. We were well catered for and appreciate all of the inputs. Thank you so much. Great joy you guys. It was great! The atmosphere was comfortable and fun, and everything was relevant to the work and relationship aspects of life. "Today was incredible. I really enjoyed the challenging tasks presented and how I was able to work with our team to accomplish them; not to mention adding the horse to the team. Having the horse work in our mini teams was super fun as they help us communicate with each other. I really enjoyed changing horses, because as soon as you were comfortable and understood communication and teamwork with one horse, it all changed with the new horse, and teamwork had to be adapted. I loved it." Success in our increasingly complex multi-discipline work environment can depend more on a team’s collaboration and management of difficult interpersonal interactions in building it’s plan and less on the desire that most of the individual employees have to be seen as top performers. Despite the best of intentions of all individuals in a team, how they interact with each other may impede trust, common understanding and common goals, producing a less than desired result. People like horses provide many nonverbal cues as to their feelings about their participation and direction in the group. Horses have no need to cooperate with people, but will cooperate and perform intricate activities, if they build trust and receive clear, concise direction from trainers. By working with horses to execute complex activities, we strongly reawaken our awareness of all the nonverbal cues that our fellow coworkers continue to provide in abundance, yet we typically manage to ignore. Learning these skills by working with horses optimizes team performance with improved understanding and collaboration. Provide managers and teams the opportunity to align their innate desire for strong performance with their actual results. Was a fantastic program overall from the planning right through to the time we had to say good bye. The opportunity to customize a learning program that focused on the key core competencies that help our employees be successful was extremely valuable. The ability to learn to lead and participate as a team member with a horse was unique and very insightful. Overall this learning will be remembered and retained unlike classroom sessions. I was somewhat skeptical about this program at the outset but after my first session I came away a firm believer that working with horses can not only help individuals to better understand themselves but can also be instrumental in developing effective teams that are aligned and working towards a common purpose. The fact that the benefits are evident almost immediately makes for a fantastic team building event that can actually produce results. It was an absolute pleasure working with Kari and her team of horses! It helped me think outside the box and find multiple solutions to the problems. Learned to trust others & respect that they may do things differently. The URSA team attended Equine Connection for a team building session with the senior staff. We found it to be very informative and a unique way to connect with each other on a new level. The communication skills needed to work as a team are vital to the success of our organization and the team found it enlightening to see how the smallest thing affects us all. Thank you to Kari and her team for the opportunity to help us better ourselves!!! This was so unexpected. I was skeptical to begin with, couldn’t think how this would be relevant to Leadership. It is totally relevant. 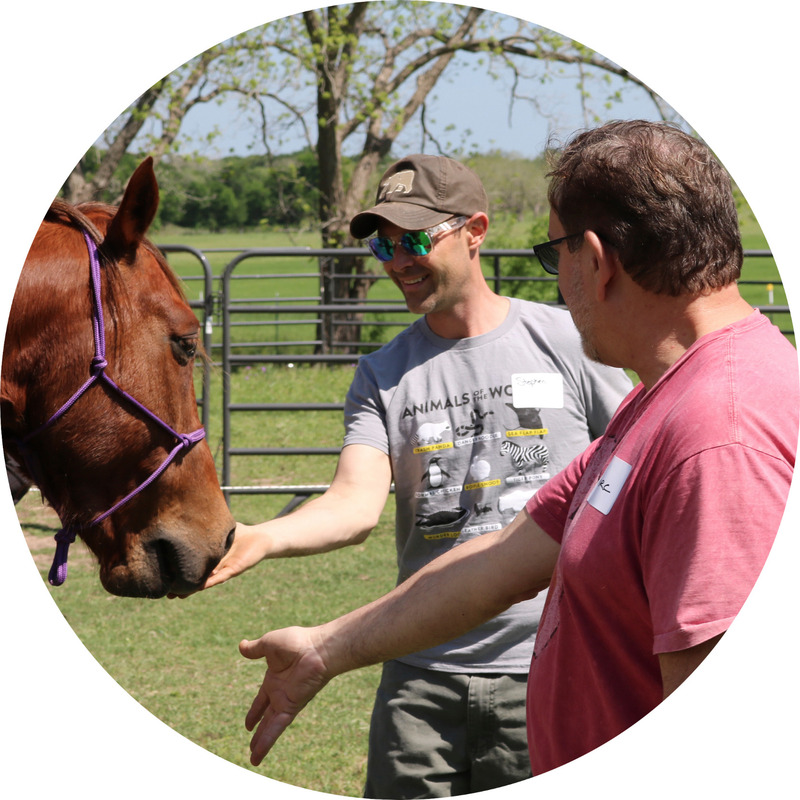 Equine assisted coaching is simply the most power coaching experience available. Mirrored through the eyes of a horse there is practical, unparalleled, clarity about how to achieve the most from the sand box you play in! I like how you connect the experience to behavioural profiles. This brings the learning back to real life! Kari & Carolyn were very engaging, supportive and excellent to work with - so enthusiastic and both have lovely energy. What a unique way to learn! Any team would benefit from this experience. How Fortunate of us! I have never spent time with the rest of my team as I arrive at the office, meet with my clients, and leave due to my schedule. I was great way to get to know everyone a bit better! Other companies do team building that is competitive and I think bringing the activities that are collaborative are so much better for bringing people together and strengthening a team. Learning to be sensitive to each star! Knowledge of appreciation of each of our contributions. This program is not only a way of connecting with your coworkers, but a way of connecting with yourself. Change is inevitable – growth is optional! Such a fantastic experience!The lessons that this program taught me were introduced in such a fun and positive way! I didn’t stop smiling the entire time! I will absolutely recommend this to everyone! The horses are such kind and understanding animals and I feel I’ve grown so much both personally and professionally! Thank you so much for the experience! Working with the horses today allowed me to appreciate what the different members of my team respond to. I feel invited into the world of the horses and it has been a blast!! I feel so much more comfortable now! What a creative experience!! Very enthusiastic and supportive facilitators who really enabled our team to get the most out of our day!! Lots of learning’s today. Today was an amazing experience that I am so happy that I was blessed to be a part of. There are so many ways companies can build their groups but I believe that what I learned today will carry throughout our organization permanently. Communication, leadership, and teamwork were just a fraction of what I learned. Thank you all so much! This was an exciting experience – self awareness is my biggest take away. Understanding that “assumptions” lead to miscommunication. It is awesome we work in different groups and different condition as well, we learned how to build the effective group that really works! I love this course! Incredible experience working in a team setting. I especially enjoyed meeting your horses and learning to include them in a team. Taught me more about some of my colleges and made me a better listener. *I loved it* Keep up the good work. Thank you. Also it was a great way to learn more about my team and to become friends with them. This was an amazing experience. I enjoyed all of the different creative challenges that we faced. They were all lessons that can be applied to our every day life. Thank you all for everything, your messages and attitude were so positive and encouraging. The food was also delicious; I always appreciate being well fed!! I absolutely loved the day and company today. It was an awesome experience! I realized how easy it can be understanding between animals and humans and how many things are very similar between us. The communication to animals and nature is a part of our life which can help humans to develop their professionalism, attitude, and change our lives for the best! My experience of Equine Connection was surprising. Horses, like people, have incredibly diverse personalities. It’s valuable learning how to respect and lead, especially when that individual may be big or intimidating. We all have the power to be and act how we want to. This experience showed me that taking initiative and adapting to a personality is more important than following what you think you’re supposed to do. It was a wonderful day! Thank you so much! Wish you love and prosperity! Was rather amazing! The horses do teach you a lot, and that’s the point when you have to question yourself about your behaviour all the time; whether you’re being respectful or pushy, polite or rude, confident or irritated, by a failure to control the animal. And here you understand that there is no such matter as control over horses. Only friendship, understanding, and mutual respect. And hugs :) P.S. Thank you! Firstly, this was an amazing experience!! I believe all teams should experience something like this! Every part of the day revealed many personal character trails that when improved on will sure benefit all areas of life!! Thank you for the great trip!! This was a much needed team-building exercise. The hosts were more than wonderful, and before we were even halfway done, our team seemed closer. Saying goodbye to the horses was an emotional experience, which was unexpected. “Thank you” can’t even come close. Wonderful job. I will DEFINITELY be back! This experience with the horses was an amazing learning opportunity. Learning to communicate with such a powerful animal in so many different ways will help in our personal and professional lives to better our relationships. Thank you so much to the staff of Equine Connection for the wonderful day and delicious food.